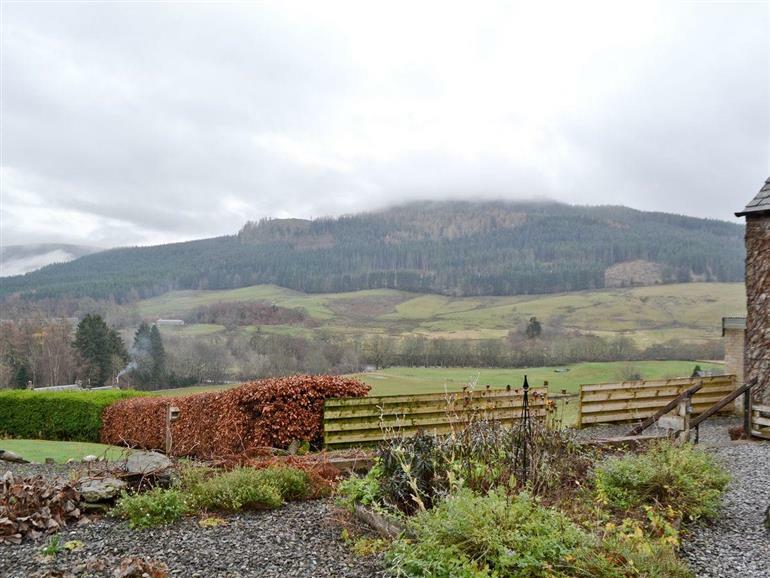 The Steading at Keltneyburn Holiday Cottages in Keltneyburn, near Aberfeldy sleeps 8 people. Keltneyburn Holiday Cottages near Aberfeldy make a lovely location to escape to; the holiday cottages are in a peaceful elevated rural setting with wonderful views over open countryside and the hills beyond. The Knock (ref SSAU [The Knock]), a peaceful cosy retreat for two, is the gable end of a traditional farm steading, completely private with its own access, large garden with private hot tub and splendid view of the surrounding hills and countryside. It has a spacious comfortable living room perfect for curling up with a book and relaxing or planning your activities for the next day. The Steading (ref SSAV) is an original farm steading dating back to the 1800’s and has now been sympathetically renovated and modernised, yet maintaining much of the original character. Set on the side of a hill you have a panoramic view of the stunning scenery including the Balachroich wild flower meadow. This is the perfect location for friends and family to spend time together with ample space for all. You can practice your cooking skills in the large kitchen and the dining room table is large enough for the whole party to enjoy dinner together and then retire to the living room with vaulted ceiling and cosy wood-burning stove and a great southerly view. With so much to do in the surrounding area if you have any energy left you can round off you day with a game of pool in the games room and then sink into your private hot tub, this is a great clear sky location, to admire the stars at night. A perfect all year round location with activities to suit all tastes, from the front door there are tracks and hills to explore on foot or bike. For the more adventurous there are mountains to climb with a great selection of Munros, such as Schiehallion and Ben Lawers within easy reach. The River Tay is near and is well-known for kayaking, river rafting and great fishing (permits are available in season and lessons can be arranged in the nearby estates). You are close to the conservation village of Fortingall with a 5000 year old Yew tree, and the historic town of Aberfeldy with many local attractions including a park, local galleries, shops, cafés and restaurants, cinema and a distillery. Several excellent local golf courses are within a short drive including Aberfeldy, Strathtay and Taymouth Castle and some of Scotlands most famous beauty spot Glen Lyon, The Falls of Dochart, Kenmore on Loch Tay, The Queen’s View at Loch Tummel and the Pass of Killiecrankie. The shop is 4 miles, with the pub and restaurant 2½ miles from Keltneyburn Holiday Cottages near Aberfeldy. Nine steps to entrance. Large living room with wood-burning stove, wooden floor and French doors. Large dining room with wooden floor. 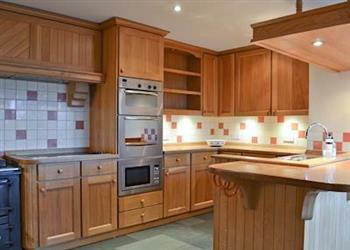 Spacious bespoke kitchen with breakfast bar and tiled floor. Utility. Games room with TV and door to garden. Double bedroom with zip and link bed (can be twin on request), TV and en-suite bathroom with over-bath shower and toilet. Further double bedroom with TV. Shower room with toilet. First floor: Two double bedrooms, each with zip and link beds, TV, views and sloping ceilings; one with en-suite bathroom with over-bath shower, separate shower cubicle and toilet. Shower room with toilet. NB: Multiple internal steps throughout the property. Sloping banks and drops in front garden. For a better idea of where Keltneyburn Holiday Cottages - The Steading is, you can see Keltneyburn Holiday Cottages - The Steading on the map below. Keltneyburn Holiday Cottages - The Steading is in Perthshire; should you be on the lookout for a special offer, you can find all the special offers in Perthshire. It's always worth checking to see what is on offer at the moment. Do you want to holiday near Keltneyburn Holiday Cottages - The Steading (SSAV), you can see other cottages within 25 miles of Keltneyburn Holiday Cottages - The Steading; have a look to find your perfect holiday location.